Star Wars: Galaxy's Edge is coming a little earlier than anticipated. However, there is going to be a catch, or actually two, for each park upon opening. Star Wars fans have eagerly been awaiting any updates for the new additions to the Disneyland and Disney World theme parks and thankfully, there have been plenty over the last several weeks. Now, we are starting to get some of the finer details, thanks to Walt Disney's annual shareholders meeting. Star Wars: Galaxy's Edge will open on May 31st at the Disneyland park in California, while August 29th will be the big day for Disney World in Florida. This is a bit earlier than originally thought, which is always a good thing. But, both parks are going to be opening in two phases. 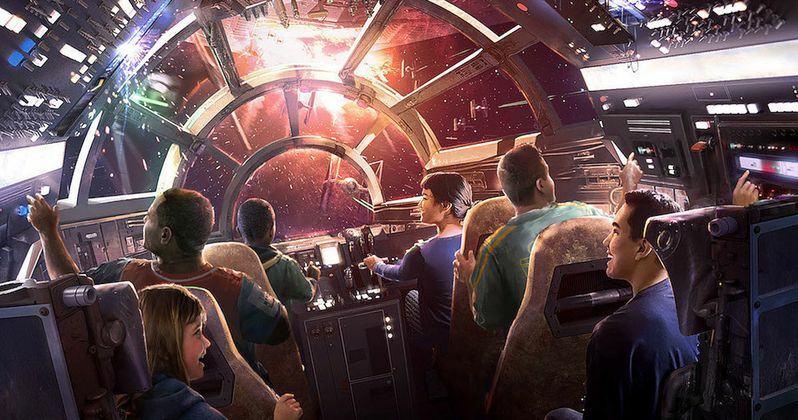 Phase one will only have Millennium Falcon: Smugglers Run along with the rest of the immersive experiences with Rise of the Resistance opening at a later, undisclosed date. It isn't immediately clear why Disney chose to make this decision, but it will certainly add to more repeat visitors. In addition to the different phases of Star Wars: Galaxy's Edge, both parks will not allow the FastPass service, which includes the MaxPass in California and the FastPass+ in Florida. It has not been announced when these services will become available for park guests, but it is certainly going to make for a really long wait. It has been estimated that the wait for Millennium Falcon: Smugglers Run could get up to six hours during the first few days that the new addition to the park opens. But, it has yet to be announced if Disneyland and Disney World will offer some kind of different system for the Star Wars area of the park. Finally, the height requirements for both Rise of the Resistance and Millennium Falcon: Smugglers Run have been announced. 38" will be the requirement for Smugglers Run, while 40" will be the requirement for Resistance when it opens. These height requirements had both been previously rumored and now have been proven to be true. Some Star Wars fans may find the latest information to be a bit frustrating, but Disney is more than likely working on something special for both parks upon their respective openings. For Star Wars fans hoping to get the full experience of Galaxy's Edge, it looks like the wait might be a little longer for the time being. Disney has not yet announced when Rise of the Resistance will be opened. Though, that news should be coming down the wire soon. This does look good for annual passholders on paper, but it has been rumored that some of the lower tier passes will not initially have access to the new additions. That has not been officially confirmed at this time. All of the latest Star Wars: Galaxy's Edge news was first reported by Walt Disney World News Today.